Battery-powered Bentleys will become a reality in as little as three years time, according to CEO Dr Wolfgang Schreiber. Speaking to us at the Detroit Motor Show, Schreiber also explained why he felt no need to add diesel models to the range. "To be honest diesel is not really a priority for us - our main markets such as China, the US and the Middle East don't care about diesel," Schreiber told us. "It's only really popular in Europe and not even the whole of Europe, Russia for example isn't interested. "It might actually be too late for diesel now, plug-in hybrids offers even better fuel economy and don't alienate petrol-only markets," he explained. "We won't see them for the next three years, but for us a plug-in hybrid is a must." 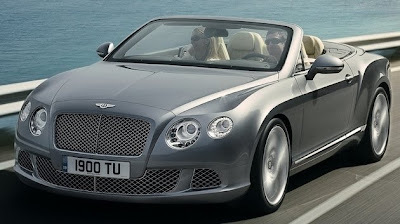 Bentley's big debut in Detroit was the new Continental GT Speed Convertible, but another high-performance drop-top could also be on the way. We saw sketches of a Mulsanne Convertible last August, while a physical prototype was shown to a select group at the Pebble Beach Concours in California, but there's been no word on that model's progress until now. "Feedback on the car was absolutely fantastic," Schreiber revealed. "We have so many exciting options to choose from, this is just one of them, but there's still a chance it will be made."